The first week of September is one of the busiest times of the year whether you’re getting kids back to school, going back to school yourself or just getting back into the swing of work (or dashing mad around fashion week). We spent August running back and forth to the beach and our hair is dry and tired from all the time in the salt water and under the bright sun. As busy as we’ve been, we haven’t had the time to make it to the salon for a good chop, some new highlights, and toning. 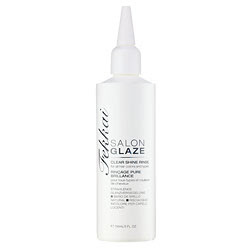 We picked up the Frederic Fekkai Salon Glaze Clear Shine Rinse thinking this is one small thing that could make a difference. The result: after a couple of uses (the effects are cumulative), our hair was smoother, shiner and looked healthier. The effects were most obvious on the underside where we don’t have highlights and the color is significantly darker. Our only complaints are that at $28 a bottle, it’s not cheap, though it’s less expensive than anything you can have done at the salon. And, since our hair is so thick and long right now, we have to use a ton of product to cover the hair root to tips as instructed, so it doesn’t go far.